Buy original Kit only - Beware of inferior fake copy sold for half the price. Found cheaper elsewhere? That only indicate counterfiet products. Make sure to buy genuine products for quality vape. After all you are inhaling this stuff. 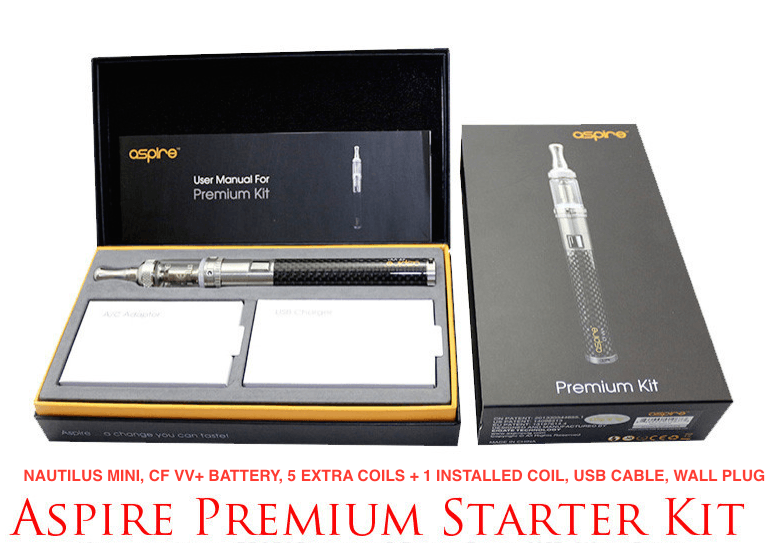 So whats included in Aspire Premium Starter Kit ? I was blown away when I was first introduced to Aspire Premium Starter Kit. Aspire has really outdone itself again. The carbon fiber finish on the battery gives it a sleek look and feel. The spring connection ensures that your tank is always connected and the seamless rotation of the variable voltage knob allows you to find the perfect level of voltage for your vape. Not only that, the Nautilus Mini is in a class of it’s own. The nifty Nautilus Mini Tank Clearomizer is a loveable and efficient little atomizer which has taken the industry by storm, easily becoming the most acclaimed device this year. The Nautilus Mini is startlingly good value for money, although the plush design alone indicates premium quality; the tank is pyrex glass, and the hardware and changeable drip tip are made from pristine stainless steel. As well as being the most good looking little atomizer of 2014, the Nautilus Mini is also one of the most groundbreaking. If features an adjustable air flow control mechanism, which allows the user to tailor the amount of e liquid processed in the tank and fine tune the length, depth and potency of their tokes or draws. The Nautilus Mini also utilizes innovative bottom vertical coil (BVC) technology, which acts to make your e-liquid last longer whilst offering a cleaner, purer vape. The Aspire Carbon Fibre VV+ Battery also incorporates some innovative technology to ensure that it works to the best standard; the durable structural design uses revolutionary spring connector technology to ensure a consistently strong connection between the battery and the tank. The carbon fibre battery holds a steplessvoltage variation of 3.3V – 4.8V, achieved quickly and easily with a smooth rotating pad. The CF VV+ has a built in overcharge protection system, which will automatically stop charging when the voltage exceeds 4.25V. Similarly, the risk of battery deterioration is minimized by theOverdischarge Protection facility, which notifies the user with 15 LED flashes and by turning off the device when the battery cell level falls lower than 3.2V. Precautionary features such as these really do act as proof that Aspire’s products are built to last – Durable, reliable, efficient and top quality. The Aspire CF VV+ is a high-end vaping power system. This battery features stainless steel endpoints, a metal button, and a carbon fiber coated tube. The Aspire CF VV+ Battery contains a revolutionary spring connector. This unique technology ensures that there will always be a strong connection between the battery and tank. The structural design and control circuit of this battery makes using it extremely reliable and stable. The CF VV+ battery allows seamless variation in the 3.3V-4.8V output variable voltage. The Nautilus Mini is the next generation of tank systems. Made of the stainless steel and Pyrex glass, the Nautilus Mini uses the Aspire Bottom Vertical Coil atomizer. This technology is designed to last longer while still giving users the purest and cleanest taste from ejuices. The Nautilus Mini includes an improved four-port adjustable airflow system that is both user friendly and reliable. The unique four-port system allows the user to adjust the draw, warmth of vapor, and amount of vapor produced. The Nautilus Mini design also makes it easy to carry, install and refill. The starter kit includes a wall plug for the USB adapter so you can charge your kit anywhere you go.